Is everybody as happy as I am that strawberries are coming back in season? Sometimes when I think about the impending heat of the Phoenix summer, one saving grace I fall back on is that at least good produce like berries will be in season. It’s kind of a rule of inverses: the higher the temperature, the lower the price of strawberries–and other summer fruits like peaches, nectarines, and cherries. Since the strawberry is one of my favorite fruits (and since I’m a big food nerd) I thought I’d do a little digging to find out more about it…whence cometh this juicy red treasure, and what secrets does it have to divulge? Here are a few interesting things I discovered! A suit of seeds: Strawberries are the only fruit to wear its seeds on the outside, with an average of 200 seeds per strawberry. 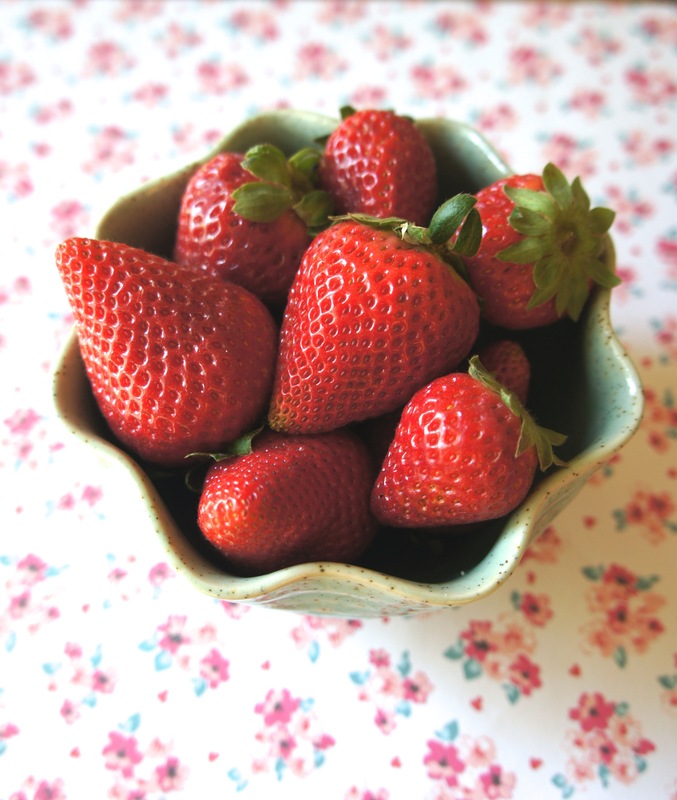 Vitamin C powerhouse: Did you know that strawberries are packed with this antioxidant nutrient? Ounce for ounce, they contain more vitamin C than oranges. Wash just before eating: Washing strawberries speeds the process of their degradation, so only wash what you will use immediately! Fruit history: Strawberries as we know them are only a little older than the USA–the garden strawberry we eat today was first bred in Brittany, France in the 1750s (though there were of course wild varieties prior to this). Strawberry bragging rights: The U.S. produces more strawberries than any other nation in the world, with estimates from 70-90% grown in California. A distant second? Turkey! (Followed by Spain and Egypt.) Who knew? Strawberry homage: There’s a museum in Wepion, Belgium called Musee de la Fraise dedicated entirely to strawberries. The region surrounding Wepion is said to possess the perfect strawberry-growing microclimate, and Wepion is considered the strawberry capitol of Belgium. If I ever go to Belgium again, I’m totally checking it out, and totally trying their famous strawberry beer. Rose family: Strawberries are actually a member of the rose family Rosaceae. They are classified as a subset of aggregate fruits within this family, known as Rosoideae. Streoberie: The word “strawberry” has been in the English language (as “streoberie” in Anglo Saxon) for at least 1,000 years, though it was first recorded in its current spelling in 1538. The etymology of the word is debated. The two most popular theories behind the “straw” part of the word are that the appearance of a strawberry’s seeds were likened to a particle of straw, or that the plant’s tendrils were seen as being “strewn” across the ground. Godzilla berry: The largest strawberry ever recorded was grown by a Japanese farmer in 2015. It weighed in at 250 grams (over half a pound!) and was 4.72 inches long. It looks more like a funky heirloom tomato than a strawberry. Now that you’re informed to the hilt about everyone’s favorite fruit, go snap up those great deals on strawberries while they’re in season!